There is nothing like a near-death experience to send a person into an existential crisis. 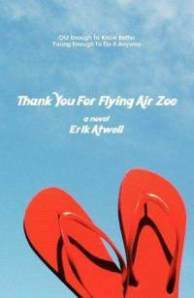 In Erik Atwell's Thank You For Flying Air Zoe, the heroine questions her life's direction and vows to change it after a brush with death. When Zoe's airplane nearly crashes, she thinks back 15 years when she and her best friends played in an all-girl garage band. In high school, the Flip-Flops were determined to take over the world with their Go-Gos- and Bangles-inspired group. However, they part ways after graduation and never get to see their dream fulfilled. As a big fan of 80s music (Fact: my parents have video of 3-year-old me dancing and singing to a medley of the latest hits, circa 1989), I adored the music references. Atwell also did a great job depicting L.A. It was a perfect read to properly excite me for my mini-vacation (which I'm still on and it's going fabulously). I loved going to some of the places mentioned in the story. I'll admit I had high expectations going into this story. It's about a woman who wants to reunite her 80s band — of course I wanted to read and love it. The fast-paced story did not disappoint. I was gripped from beginning to end, and would gladly read future offerings from Atwell. Be sure to check back tomorrow to read my interview with the author. So glad you loved the book! Great review - I can't wait to read the book! Enjoy the rest of your mini-vacation - play some 80's hits to capture the mood. My parents are in the process of digitizing our old home videos. I'll share this one when they get to it. I was so much cooler when I was 3.